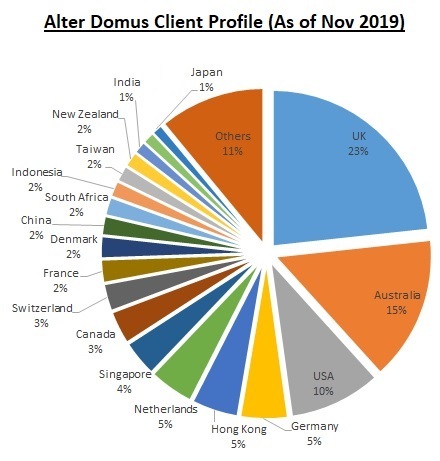 "Alter Domus" means "Second Home" in Latin and it forms the basis for the name of our company; we help clients make Malaysia their second (or even primary) home. The company was incorporated in Malaysia as Alter Domus (MM2H) Sdn. Bhd. in 2006. Prior to this company, we were known as Alter Domus Management and Services Sdn. Bhd. 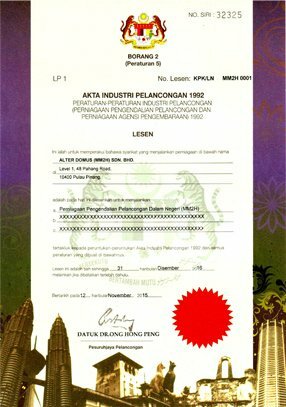 However, in 2006 the Malaysian Ministry of Tourism mandated that all the MM2H sponsors be licensed and the company names shall have the words "(MM2H)", thus, our company was formed to comply with the licensing requirements and now, we are the leading MM2H consultant in Penang offering assistance in visa application and its associated services like tax-free car purchase, import of household effects and home management. We are proud to be the first licensee of Malaysia My Second Home Program with the license number MM2H/001. Unofficially, we have been in this business since 2001 and at that time, we do not need to set up a company to help our clients apply for the visa. It was done via word of mouth and the operations were carried out informally. We have grown leaps and bounds since 2006 and now we are one of the largest sponsor in Malaysia and the largest in Penang. Fast response to emails and inquiries. You will read about this in a lot of testimonials. If we are available, we will usually respond within hours. We work 16 hours day, 7 days a week and 365 days a year when it comes to responding to emails and inquiries. We work during festivities (like Chinese New Year) and weekends. We go the extra mile to ensure that you get the best out of everything, be it visa application, home management or any information that you need. We just don’t stop at the stage “Sorry, we cannot help you there” unless it is really "the end of the road". Being one of the most trusted visa consultants in Malaysia, we do the visa application diligently and carefully with the intention of ensuring you get the visa. We do not “do it for the sake of doing it” but rather work towards giving you 120% chance of getting the visa. We do not use the phase "We hope you get the visa" rather "We want you to get the visa". Standing by your side at all times when it comes to dealing with contractor or third party. Advice is free for life and we will continue to give you any advice, even after 20 years. 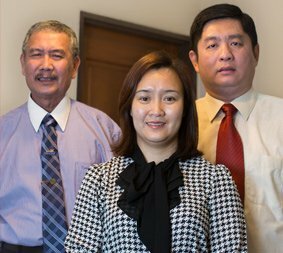 We are a family-run company with a small group of dedicated staff. We run this company ourselves and do not hire managers to run it. Hence, there will be no principal-agent conflict when it comes to ensuring client satisfaction. All our clients are our friends eventually and they continue to visit our office years after the MM2H is completed, to do visa transfer or if they have any questions or problems that they think we can help. It is also not a surprise that a large majority of our clients are referrals from our existing clients. We don’t compromise on honesty. If we think we cannot do the visa successfully, we will tell you so. Our current approval rate is 99.8%. The 0.2% is due to our clients who want to push ahead even though the success rate is less than 50%. If not for them, our approval will be perfect. Presently we are doing home management for many of our clients and they would not have asked us to take care of their cars and properties if they do not trust us. You just don’t have access to their houses and cars if they think you are not honest or trustworthy. For some clients, we have managed their homes since 2007. Please click here to see our MM2H license with the license number MM2H/0001 that is expiring in Dec 2016. We will continue to renew this license as MM2H is our core business. He is responsible for answering all the email inquiries, preparation of documentation for submission and marketing. He holds an MBA from Manchester Business School, UK and a B.Sc. in Microelectronics and Physics from Campbell University, NC, USA. He complements Roselind Moey, his wife on running the company as Roselind is more focused on post-endorsement assistance. Apart from assisting her husband in the marketing, she handles the daily company operations. Prior to becoming a relocation specialist, she was a Company Secretary for a public listed firm in Penang. She has the professional qualification from ICSA (Institute Chartered Secretaries and Administrators), United Kingdom. She is still an Associate Member of MAICSA (Malaysian Association of Institute Chartered Secretaries and Administrators) and has been a company secretary since 1997. She was with PricewaterhouseCoopers Singapore from 1997-2000 before returning to her hometown in Penang. She has experience in negotiating with people and handling the needs of foreigners. He is the father of Roselind Moey and was an Immigration officer before retiring in 2005. He is responsible for submitting correct Immigration documentation. His knowledge from his job retirement is critical to ensuring the success of the company.